Whenever I feel the need to turn my smoothie to the “green” side, I generally do so with spinach. I’m fortunate enough to have access to local, organic spinach from my CSA (community sponsored agriculture). Spinach blends easier and isn’t as bitter as other greens like kale and dandelion, which makes it easier to create a delicious smoothie. Parents, keep this in mind when trying to get your kids to drink green smoothies. Antioxidants galore: spinach and blueberries combine for a massive amount of these free radical scavengers. Phytonutrients in spinach proven to be anti-inflammatory and anti-cancerous. Spinach is extremely rich in vitamin K, which is important for maintaining bone health. 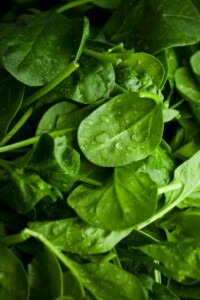 Spinach is also rich in vitamin A, manganese, folate, magnesium, and iron. Blueberries offer cardiovascular benefits, cognitive benefits (brain berries), support eye health, and are anti-cancerous. Vitamin C: blueberries, spinach, and bananas all contain this essential vitamin. Now that you know how healthy the ingredients for this blueberry spinach green smoothie are, let’s get to the recipe. Add the ingredients into your high speed blender and blend for 30-45 seconds or until the desired consistency is reached. If you try this recipe please leave a comment below and tell me all about it. Cheers! Live in or around Brighton, MI where I reside? Here’s the farm I get my organic produce from: Stone Coop Farm. I make mine with 1.5 cups of Blueberries, a special K protein shake, 2 cups spinach, 2 small bananas, and a half scoop of Chocolate Whey protein. I only share and turn into 2 servings if it isn’t a post workout meal, or if I need the pick me up in the morning. I use Almond Milk instead of water and sometimes use 1 cup of kale and 1 cup of spinach. I also use agave nectar as a sweetener when I don’t have honey or stevia. I made this smoothie and loved it! It was quick and easy to make. How I changed it up was I didn’t have just spinach, but I did have a bag of mixed spinach, baby boy choy and baby chards in my fridge so I used that. I added a tablespoon of chia seeds ( Make sure you soak them overnight) and 1 1/2 cups of ice which made it nice and cold on a warm day. I didn’t add any sweetener since the fruit is sweet enough. Thank you for the recipe, it is going to the top of my list! Awesome! Thanks for sharing, Diane! I made this, but used 1 cup of blueberries and a little ice..great taste! Extra blueberries and ice, nice Vanessa! I made this and added two tablespoons of dried oatmeal. Delicious! I was looking for a morning shake that called for 4-5 ingredients and stumbled across this one. I used 1/2 cup of water & 1/2 cup of Greek yogurt. SO good! Thanks for posting the perfect shake recipe. Glad to hear you like this smoothie recipe. Nice move incorporating the Greek yogurt. Awesome, Christina! Thanks for sharing. I am not a big fan of blueberries and I wasn’t real optimistic about the combo of them with spinach but this smoothie is great!! I’m not big on bananas either so I tried it with soy milk instead of water and left out the banana. Super creamy and delicious! Glad you liked this smoothie. Changing up the ingredients based on your preferences is what I preach ;) Avocado is my favorite substitute for banana. Thank you, Ryan for the recipe! I made my first smoothie today — 4 handfuls of spinach, 1 frozen banana, 1 cup of water, handful of blueberries, maple syrup, salt, cinnamon, a dash of vanilla. Delicious! I drank it and then thought I would need to eat “real food” like I would have with one of those pre-made sugary protein shakes. But wonder of wonders, I wasn’t hungry :-). And I stayed that way for the next several hours. It was great! I can’t wait to make my next one. I think next time I’ll leave out the vanilla and syrup, only use half the banana and I’ll add some pear. I can’t wait! Fantastic, Dee! Welcome aboard the healthy smoothie train to better health and feeling great :) That’s an impressive first smoothie. My first smoothie pales in comparison, and if I remember correctly didn’t taste so great. You know you’ve hit the nail on the head when you’re not hungry for several hours after a smoothie. You were properly satiated. Good luck with all your future creations. Made this for my breakfast and added tablespoon of flax seed and 1/2 teaspoon of ginger and 1tablespoon whey vanilla protein, no added sweetener. Really enjoyed it. I like to use ginger and/or turmeric where possible for my arthritis. I substituted almond milk for the water and added some fresh ginger. Really good. Thanks! I tried this with coconut water instead of water and added some chia seeds. I think the secret is to have everything really cold. Warm shakes are not nice :( Frozen banana is something new for me but so easy to use. Thank you. Coconut water and chia seeds were nice add-ons. I agree, cold smoothies are where it’s at, especially in warmer climates. I followed the recipe and then added about a half cup raw mushrooms and a bit more water. No one in my family knew they ate them via smoothie-they hate mushrooms! Delicious! i just made this smoothie, just blueberries, one medium banana, spinach, flax seeds and a cup of water . it was delicious. thank you so much ! Superb, lovely, and creamy….I like the sounds of that :) Just added Greek yogurt as an add-on. You’re welcome, Jami! Nothing like a quick and healthy smoothie to start your day. I made this but substituted the water for mixed berry juice and added flax seeds. So good! Thanks for the recipe! I made this, but I had no protein so i added some mixed seeds and nuts instead. Also I put a small bit of pure coconut oil in and a small bit of apple juice and a dash of agave syrup! I love this!! So healthy after workout drink. Isn’t 2 tablespoons cinnamon too much? I never heard of using more than 1/2 to 1 teaspoon. I always, always, always use coconut water in my smoothies. I love spinach and blueberry smoothies. If i have cherries around i always throw about a cup of those in as well. Delicious. Coconut water is an excellent liquid for smoothies, especially fresh from a Thai coconut. Can these be frozen and thawed out later? Yes, you can freeze your smoothies, thaw, and consume later. You can also make smoothie popsicles if you have molds. I have been doing this but with frozen spinach and blueberries. I only put in half a banana though as I don’t really like them. I also add almond milk and a little water. I have it every morning and it is fantastic. Thanks for sharing your version of this recipe, Anna. I love how you modified it to suite your preferences. You might try 1/2 avocado and eliminate the banana all together. I love this recipe! Best smoothie ever. I’ve been drinking it for a couple of years. Mine is not all that different. Delish! And super good for you! Keeps you full for hours also. Also forgot cup of almond milk, or water. Love how you modified this recipe to make it your own, Jenn! Thanks for sharing. I’ve just tried this – my first homemade smoothie. Added fat-free greek yogurt and spirulina powder. It tastes ver good and is easy to make with a handheld blender. Thanks! Love this smoothie my add ons were flaxseed, hemp protein powder. Nice add-ons and great to hear you loved this smoothie, Maxine. Mango (frozen is best!) I banana, 2 hands full of spinach (or as much as I can cram in the blender! ), several slices of cucumber, cup of blueberries, a little orange juice, a scoop of strawberry Promax for extra 30mg protein and 300mls ice water. Wow best green smoothie yet! Now a Blueberry fan!! Thanks! Didn’t need to go to Blueberry hill for my thrill! I’m a big smoothie eater and I was wondering when using the Greek yogurt will it give off a sour taste or blend with the fruit it’s mixed with? I rarely taste the Greek yogurt in my smoothies. Fruit and other sweeteners usually mask the sour taste pretty well. Hi :). I’m in Oz and snap! I blend 2 cups of spinach, one cup of frozen blueberries, one tbs chia seeds, 4 ice blocks and water – Every morning. I discovered your website after googling “are blueberries and spinach healthy” haha! Love this recipe! I use blueberries, bananas, spinach, flax seed meal, almond butter and coconut water. My kids love it too! Fantastic! Thanks for sharing, Theresa. I made this smoothie this morning about 20oz of it. I used a cup and a half of mixed berries (Blueberries, Rasp, Black Rasp) and about 2 cups of spinach. I Substituted the a half of a cup of the water for almond milk so 1/2 cup almond milk 1/2 cup of water, and old fashion oats to fill me up a little more! Sometimes I use just aloe water instead of the half water half almond milk! Sounds delicious, Lexi! Thanks for sharing your recipe. I made this smoothie with banana, strawberry, spinach, and blueberries. I added 2% milk intead if water. It was great. Good deal, Paul. Thanks for sharing. I’ve never been a smoothie person, in fact I’ve hated the consistency. But I wanted to try one since I’m always hearing about people raving about blueberry spinache smoothies. I made this one and both my 13 year old son and I liked it. I’m going to add oatmeal to it next time! Thanx for getting me into smoothies! Music to my ears, Kat :) Hope you and your son enjoy many more smoothies to come.